Posted by Jeff on Tuesday, November 9, 2010, at 8:38 pm. Filed under Uncategorized. Follow any responses to this post with its comments RSS feed. You can post a comment or trackback from your blog. 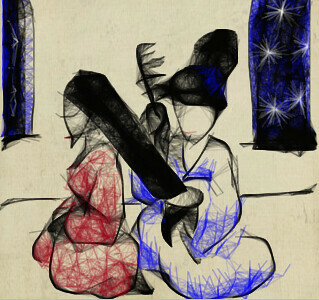 Love the construction, colors, and the “familiarity” of one geisha brushing the hair of another. The addition of the stars is a great touch, gives it more depth, more life.